Even though it might be hard for some of you, given my history, to believe that I am now the co owner of a garden with more than just dead grass it is actually true. Since our house was built we have slowly added to the organic life in our backyard. The latest addition is the topic of my new layout. It's a 28 meter long flower bed with lavendar and small trees. I think it's very pretty and understated. Our hope is that next year the lavendar will spread across the dirt inside the flower bed and cover it. If we can keep it alive that is! Everything about you, your home, your layouts ... is pretty and understated. And that is why I love your style! Your lavendar and little trees look lovely. I was just thinking that I wanted to plant lavendar as well. Maybe I'll follow your lead. I recently had the fortune of having a photo shoot in a large field lavender farm - the smell is intoxicating! 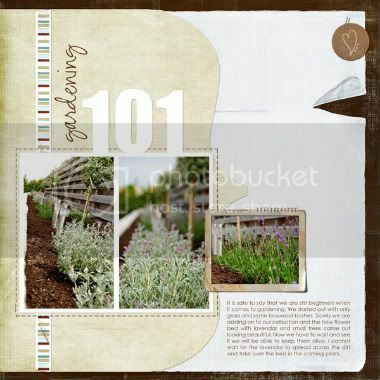 I've been contemplating lavender flanking the home ever since.